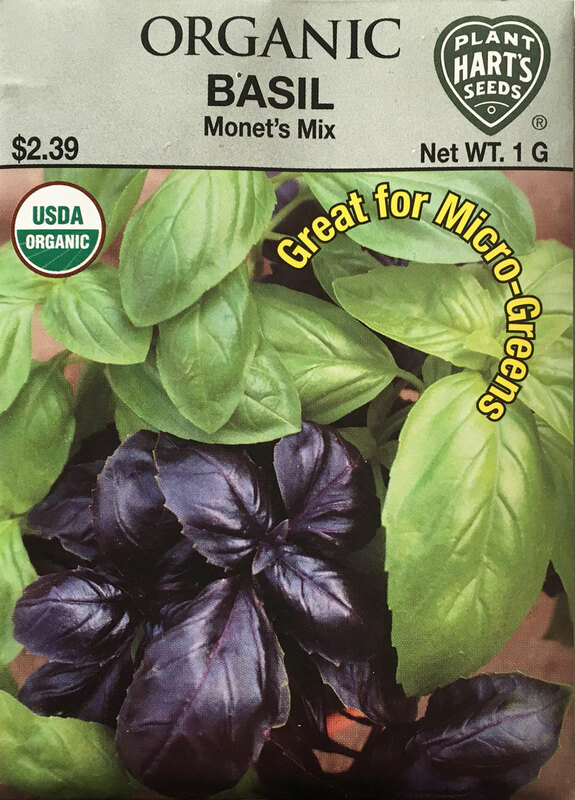 We named this blend of Genovese and Red Rubin basils after Claude Monet, who loved to combine the colors of purple and green in his watercolors. Plants are tall with large shiny leaves, great fragrance and flavor. Some plants may be mottled with both green and purple. Basil is a 'thirsty' plant, thriving in warm weather. Keep soil moist, supplementing rainfall in dry weather to approximate 3 inches of water per week. Remove flowers regularly to encourage more leaf growth. Planting time - indoors 4-6 weeks before last frost is expected in your area. Thinning - or transplant when plants are 3 inches tall into individual 4 inch containers. Final spacing should be 24 inches apart in the garden. Do not plant outside until nighttime temperatures do not go below 60 degrees.